I've been in San Francisco for nearly three months now, but I'm still getting my bearings. I knew Portland like the back of my hand — things like where to get great meals or obscure ingredients like passionfruit and dulcey blonde chocolate came second nature to me. But I've been tripping a lot in San Francisco, frequently disappointed by restaurant recommendations from trusted websites and having to visit five different grocery stores to find what I want. It sounds petty and minor, but the constant feeling of being lost and not knowing where to go tells me that I'm still very new and that this city is still not really my home. I'm not going to lie. There have been many moments—usually after an unremarkable meal at a critically acclaimed and very expensive restaurant, or, having scoured the third grocery store in a row elbowing my way through crowds only to find that they don't even stock what I was looking for in the first place— where I think to myself: What have I done? Why did I ever leave? But hopefully, this feeling of displacement will pass soon and I'll finally figure out where in this damn city I can find fresh passionfruit. And when I do, you guys are getting passionfruit curd-filled donuts. Because that was what I was initially planning on making this weekend. But three farmer's markets later, I was still empty handed. I'm serious — San Franciscans, help me out here, where on earth do you find passionfruit in this city? You'd think that with such a large Asian and Hispanic population that it'd be easily available, but apparently not. So I gave up and just bought a whole host of strawberries, cherries, and plums. They looked delicious and in their prime anyway. 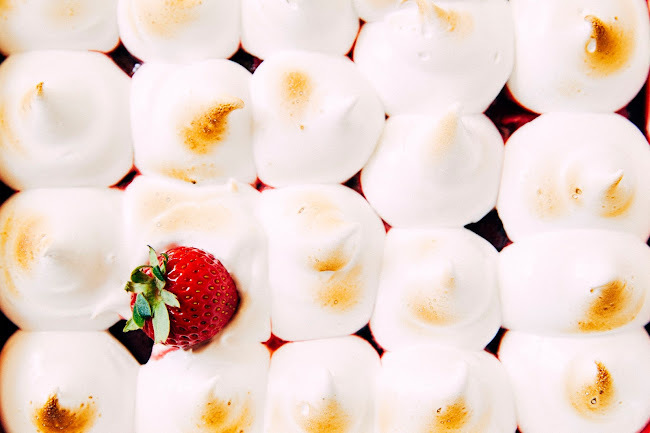 The initial plan was to just bake them and serve them with a side of whipped cream, but when baked, the fruits turned out incredibly soupy. It looked like I had murdered something in my white porcelain pan. So I ended up whipping up a soft, almost marshmallowy meringue to top the fruit off and finally breaking out the creme brulee torch Erlend bought me for my birthday to torch the meringue. Just 'cuz, ya know? Feel free to use any combination of fruits that you want! This would be great with an all berry combination, or an all cherry one. I threw in some plums because I worried that the strawberries and cherries together would be too sweet, and knew that plums tend to get sour in the oven. Because the marshmallow topping is so intense and sweet, I didn't add any sugar to the fruit bake. If you're using a fruit combination that is tarter than mine, toss the fruit in 1-2 tablespoons of granulated sugar before baking. 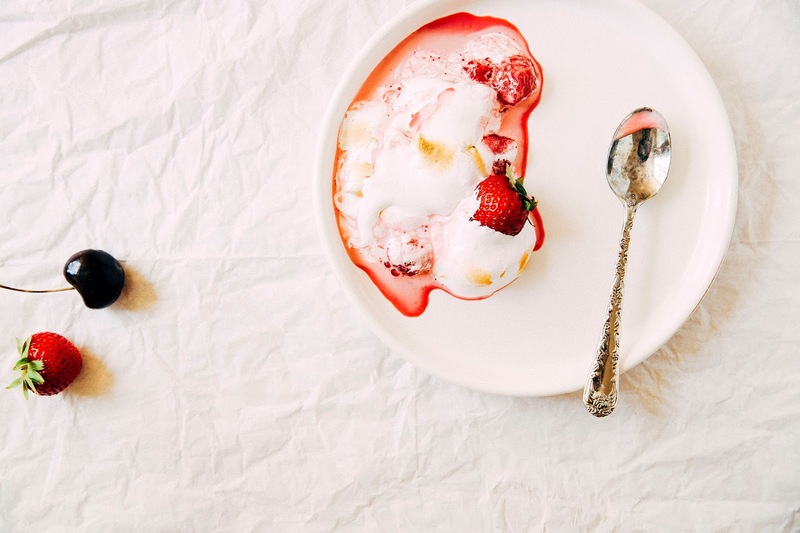 If you find the fruit to be too liquidy, you can throw in a tablespoon or two of cornstarch to solidify things. The cornstarch will thicken the fruit, and give it a texture more similar to the filling of a fruit pie. 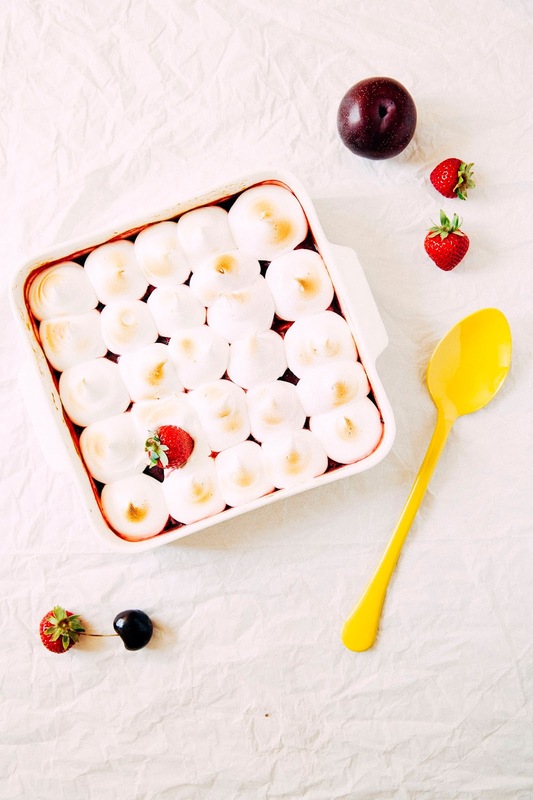 Only put the marshmallow meringue topping on the fruit when the fruit has cooled completely to room temperature. 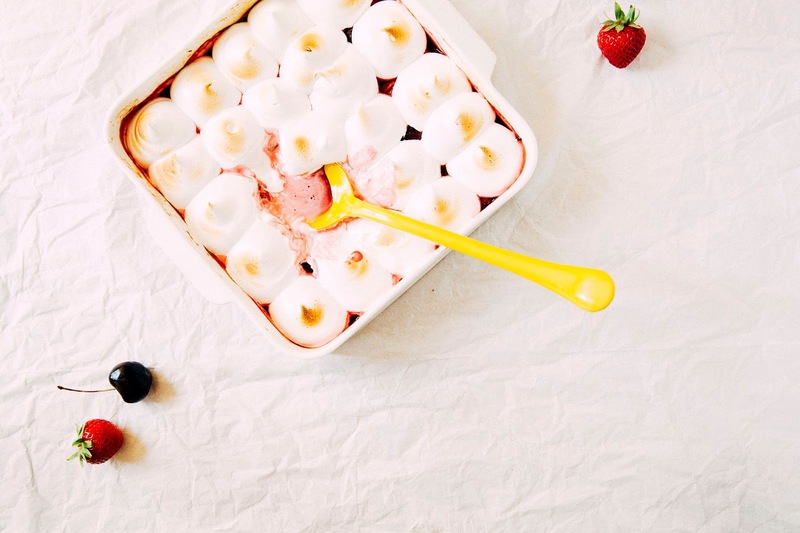 The marshmallow meringue has a tendency to melt easily, especially in warm weather. Center a rack in the oven and preheat to 400 (F). 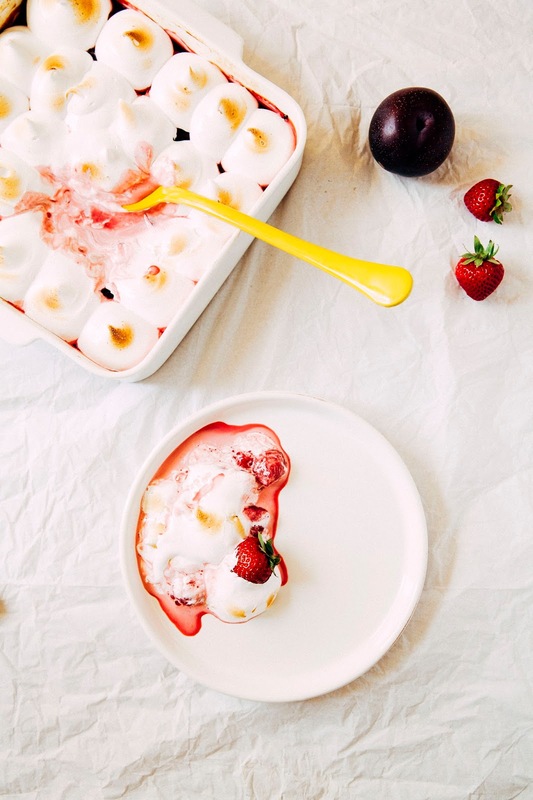 In a 9-inch square pan, combine 1 pint halved strawberries, 1/2 pint fresh cherries, and the sliced plums. Drizzle 2 tablespoons balsamic vinegar over the fruit mixture, before sprinkling with a pinch of kosher salt. Use a rubber spatula to mix and toss the fruit, coating the fruit with the balsamic vinegar. Transfer the pan into the preheated oven and bake for 20 minutes, until the fruit softens and turns juicy. Remove from the oven and allow to cool on a wire rack completely. As the fruit cools, it should thicken and set. 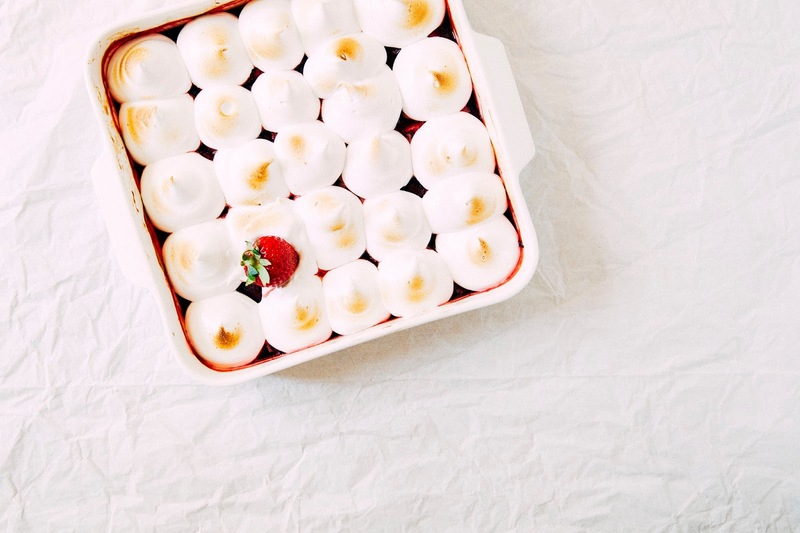 Once the fruit has cooled to room temperature, make the marshmallow meringue topping. In a medium, heavy bottom saucepan over medium-low heat, combine 1 1/2 cups granulated sugar, 1/4 teaspoon cream of tartar and 1/4 cup of water. Whisk constantly until the sugar starts to dissolve, continuing to do so until the mixture reaches 240 (F) as measured by a candy thermometer. When the mixture reaches 240 (F), it should be syrupy. Immediately transfer to a heatproof liquid measuring cup and work quickly to make sure that it maintains its temperature. In the bowl of a freestanding electric mixer fitted with a whisk attachment, combine 3 large egg whites and 1 teaspoon pure vanilla extract. With the mixture on medium speed, slowly pour the fresh sugar syrup down the side of the mixer bowl. When all the syrup is added, turn the mixer speed to medium-high and whisk until the icing becomes thick and holds a firm peak. Continue to whisk until the icing is just slightly warm and very thick, about 10 minutes total. DO NOT CONTINUE TO BEAT FOR LONGER THAN 10 MINUTES, otherwise the icing will thicken too much, become cement-like and impossible to spread and pipe. Use immediately by transferring to a piping bag with a large round tip. 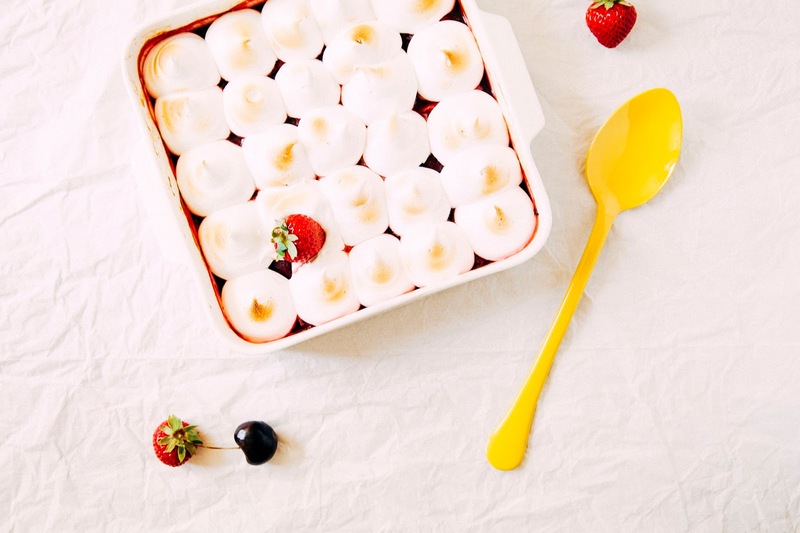 Pipe several dollops of marshmallow meringue on to top of the baked fruit. Use a chef's torch to brown the dollops. Serve immediately — the meringue doesn't keep well overnight and tends to deflate after 24 hours.